Are you a first-time ABPM event attendee? Registration information (name, company, email) will be shared with the other Conference participants to facilitate communications and networking before, during, and after the conference. Please indicate your consent to be included by choosing YES, (I consent) or NO (I do not consent). If you are a first-time attendee, would you like to be paired with a veteran ABPM Ambassador to introduce you to fellow attendees on the first day of the conference? If you are a veteran ABPM attendee, would you like to be paired with a new attendee to introduce them to fellow attendees on the first day of the conference? The Spring Conference has reached capacity. Please email info@abpm.com to be placed on the wait list. ABPM conferences are excellent professional development venues. And with so many ideas being shared, so much creativity being generated, and so many connections being made, attendees will inevitably leave energized and ready to implement new initiatives that will take their programs to the next level. Maximum attendance for this event is 300 people and last year's conference sold out so register early! Due to reduced conference capacity, registration is limited to four Supplier Members per company. Briefing professionals will take registration priority. 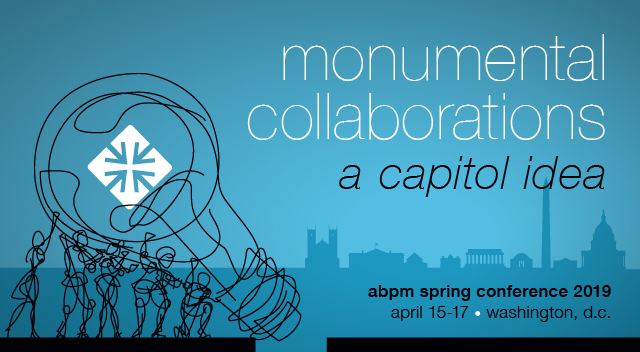 ABPM President Elizabeth Simpson will kick off the conference by sharing her thoughts on the conference theme “Monumental Collaborations: A Capitol Idea" and how it relates to her observations about current trends in the briefing profession. Winning Body Language to Build Trust, Gain Credibility and Sell. Voted the #1 Body Language Professional in the world, Mark Bowden is passionate about sharing the most influential and persuasive communication techniques to stand out, win trust, and build credibility every time you speak. The most effective speakers never appear to make any effort at all to win us over. They are natural, likeable, clear and consultative. They learn about our needs by asking intelligent questions and offer solutions that feel right. In this compelling and interactive keynote, you will learn how – through the simplest use of body language – you can build strong and lasting relationships, win and hold onto trust, gain credibility, be more consultative and become a trusted advisor to your clients and key stakeholders.. Enjoy food and refreshment during this heavy hors d'oeuvres reception while you get to know the ABPM supplier members who add so much value to the briefing profession. Whether you're in the market for products and services now, or whether you want to collect collaterals for future reference, this celebration of the ABPM supplier members is designed to meet your information needs! During the Supplier Celebration game, briefing professionals will collaborate with Suppliers to solve their top challenges and become eligible for prizes in the process! Click here to see a list of game prizes. Detailed session descriptions are available in this final agenda. Conference participants will not sign up ahead of the conference for Tuesday breakout sessions; they are first come, first served. New Breakout Session Format: Because of your feedback, session formats are evolving this year! With so many great breakout session topics in each time slot, we often hear from conference participants that it’s difficult to choose which one to attend. To give you a chance to get even more out of the conference, we are introducing a “Flash” session for each breakout. The sessions will be divided into 2 segments: the first 60 minutes will be the Primary session for content and collaboration followed by 10 minutes to switch rooms, and then a second 20 minute “flash” session. Primary Session: The first 60 minutes will be a conversation between session leaders and the participants. Session leaders will provide a short presentation to set the context and share their knowledge on the topic. This will get the conversation going and the session leader will facilitate a conversation among participants for the remainder of the 60 minutes. This approach uses as its model the increasingly collaborative formats we are seeing in today’s briefing programs. Flash Session: After the first 60 minutes, session leaders will remain in their rooms while conference participants have 10 minutes to move to another breakout room for a “flash session” on any of the other sessions offered during that time slot. In this 20 minute segment, session leaders will provide high-level talking points as well as relevant points from the collaborative portion of the 60-minute segment. Returning this year, conference participants may choose from two briefing program tracks, an Experiential Track, or a Leadership Day track. Assignments will be made on a first-come, first-served basis. See the Final Agenda for tour day groups and descriptions. 6:00 pm - 10:00 pm: Awards Program and Gala Dinner - Maxmium 260 attendees - register early to attend! We are excited to be aboard the Odyssey for the 18th annual World Class Briefing Awards Ceremony and Gala Dinner. Designed specifically to travel beneath the historic bridges spanning the Potomac, Odyssey offers amazing river views of the nation’s greatest monuments from every table. Odyssey will take a Northern track and sail under the 14th Street Bridge up towards the Kennedy Center and Georgetown, or, alternatively Odyssey will take a Southern track and sail south on the Potomac past historical Old Town Alexandria and National Harbor. Need more justification as you work to get approval to attend? In addition to the conference brochure, show your management some quotes from attendees and ratings from the Spring 2018 evaluations. Lodging: The Capital Hilton located at 1001 16th St. NW in Washington DC, is the primary location of the 2019 ABPM Spring Conference. The ABPM Block at the Capital Hilton is available via this link. The $249 plus tax ABPM room block rate is available on a first-come, first-served basis and is based on availability. Once all rooms at the conference rate are booked, regular rates will be charged. Book early! Conference Fee: The price for Spring Conference registration is $1095 for members, $1345 for non-members (briefing professionals or employees of Supplier Member companies only - vendors must be recommended Supplier Members to attend ABPM events). Four Plus Discount: Plan to register 4 or more attendees from one company? Email info@abpm.com to receive a 10% off discount code to use during the registration process. All prices are Early Bird prices. After February 22, the member rate will increase to $1245 and the non-member rate will increase to $1495. During registration, you can pay with credit card (ABPM accepts Mastercard, Visa, American Express or Discover) or you can create an invoice to submit to your AP department. New Membership/Registration Bundle Deal: Receive the first year of membership free with non-member rate conference registration! This offer is only available to those who have never been ABPM members. Suggested Airport and Parking: The airport nearest the Capital Hilton is Ronald Reagan International Airport (DCA). It is 4 mi drive from the Capital Hilton (20-25 minutes). Valet parking at the hotel is $60 per night and $75 for oversized vehicles. Alternatively, there is a Park America parking lot at 1301 K St NW offering approximately $30 per night parking. Dress: All activities are business casual with the exception of the Gala Awards Dinner which is cocktail. Layering during conference sessions is recommended. Payment & Cancellation Policy: To receive the Early Bird Rate, registration fee must be paid by Friday February 22, 2019. All other registration fees must be paid prior to Friday, April 12, 2019. You are registered at the time you receive a conference confirmation email from ABPM. Due to commitments for catering and transportation, we regret that we are unable to issue refunds/credits or void outstanding invoices for cancellations received after Friday, March 15, 2019. However, substitutions may be made at any time. Cancellation and substitution notices must be received via email to info@abpm.com.